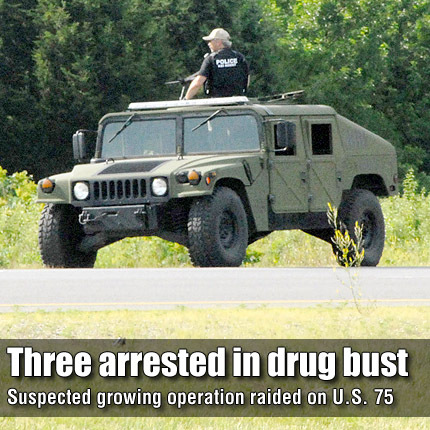 A member of the Kansas Bureau of Investigation stands armed and ready atop a Hummer during a manhunt Tuesday along U.S. 75. CARBONDALE—A tip led Osage County Sheriff’s Officers to a suspected marijuana growing operation at 117th Street and U.S. 75 north of Carbondale, where three arrests were made Tuesday morning. Officers arrived around 4:30 a.m., with first subject arrested around 6:30 on property located south 117th Street and east of U.S. 75 mile marker 143. Two more suspects were apprehended around 9 a.m. following a search of the property conducted by officers, with the assistance of the Kansas Bureau of Investigation, Kansas Highway Patrol, Coffey County Sheriff’s Office and a Lyon County Sheriff’s Deputy. Marcelo Parra-Ocmo, 41, Kansas City, Mo., and Ernesto Duenas-Acoen, 20, were listed in the Osage County Jail log Wednesday for cultivation of marijuana for arrests made June 14. An unnamed juvenile, 15, was also arrested and jailed. Dunn stated the three appeared to be living on the property. “We covered a mile section from 117th Street to 125th Street and U.S. 75 to Adams Road to make sure we didn’t have any runners,” Dunn said. In addition to the arrest, officers confiscated in excess of 5,000 plants, valued between $1,000 and $2,000 each, according to Dunn. The plants were dispersed among a wooded area. Dunn said the plants were photographed, documented and samples of them will be taken to a lab. She said the plants had been destroyed as of Wednesday.